MANNY “Pacman” PACQUIAO has made a career out of taking opponents to school. He has done it 60 times inside a boxing ring. Now, boxing’s only eight-division world champion has accepted an invitation to return to school himself and speak at the Oxford Union on the campus of the University Oxford and the Cambridge Union, at the University of Cambridge on Monday, November 5, and Tuesday, November 6, respectively. The Oxford Union has a rich history. Founded in 1823, it has grown to become the most prestigious student society in the world. The Oxford Union, the largest society at the University of Oxford, has hosted world leaders in every field, including Albert Einstein, Winston Churchill, Malcolm X, Mother Teresa, the Dalai Lama, Roger Bannister, and former U.S. Presidents Reagan, Nixon and Carter, to name a few. Pacquiao (60-7-2, 39 KOs), who hails from Sarangani Province in the Philippines, is the only sitting Congressman and Senator to win a world title. After serving two terms as congressman, Pacquiao was elected to a Philippine Senate seat in May 2016, capturing over 16 million votes nationally. Pacquiao’s boxing resume features victories over current and future Hall of Famers, including Oscar De La Hoya, Ricky Hatton, Marco Antonio Barrera, Erik Morales, Miguel Cotto, Shane Mosley, and Juan Manuel Marquez. 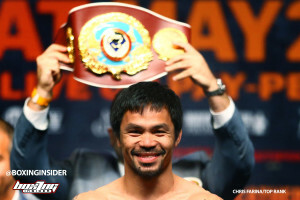 A three-time Fighter of the Year and the Boxing Writers Association of America’s reigning Fighter of the Decade, Pacquiao regained the welterweight title for a fourth time on July 15 by knocking out defending WBA world champion Lucas Matthyssee. The fight took place at Axiata Arena in Kuala Lampur, Malaysia. Philippine President Rodrigo R. Duerte and Malaysian Prime Minister Mahathir Mohammad were in attendance, marking the first time two heads of state attended a championship-boxing event. Pacquiao recently announced that he has entered into an exclusive agreement to work with manager / advisor Al Haymon. The new alliance will have team Pacquiao and Haymon working together to navigate the remainder of Pacquiao’s illustrious career. Pacquiao’s first defense of the WBA welterweight world title will kick off the new partnership and will have him appear on the Premier Boxing Champions series. Pacquiao’s promotion company, MP Promotions, will promote all of his upcoming bouts under this new alignment with Haymon. MP Promotions will also work with Haymon to bring some of the best fighters from the Philippines and Asia to the United States to appear on the PBC series.